Zero: Tsukihami no Kamen, otherwise what would have been known as Fatal Frame 4 (in North America) or Project Zero 4 (in Europe) got caught in a bad position. Unlike the previous games of the series, which were published directly by Tecmo, the latest release was handled by Nintendo themselves. The game apparently shipped with some annoying bugs. The way I understand it, Nintendo ask Tecmo to fix these issues, and Tecmo told them to, more or less, shove it. It was vaguely almost scheduled for a European release, at least, but that fell through the cracks for any number of reasons. The awesome thing about the current generation of consoles is that they're much closer to modern computers than the 8, 16 or even 32-bit days. This means that, programming wise, they tend to be much easier to hack. We've already seen fan translations for Tales of Innocence and Soma Bringer picking up the slack where Namco-Bandai and Nintendo have failed. Well, there's now an English translation for Zero: Tsukihami no Kamen, going under the name Fatal Frame 4: Mask of the Lunar Eclipse. What's more, you don't have to resort to piracy to get the patch working - I've heard it won't even worked with pirated versions, although there appears to be torrents around that suggest otherwise. Assuming you want to play the game legitimately, you'll need a copy of the game. - the problem is, finding it. Zero: Tsukihami no Kamen is a year and a half old now, having been released in July 2008. Most import retailers no longer carry it, or are still carrying it at retail price. My eyebrows furrow when stuff like this happens, because while prices can plummet in the Japanese marketplace pretty quickly, the importers usually never drop their prices unless it's a huge failure or it gets a reprint, so new titles that can be found on the streets for a few thousand yen are still being sold to the rest of the world for the equivalent of $75. It's good to be aware when you're being gouged! Yeah, it's still pretty expensive over there, too. Of course, like other marketplaces, Amazon isn't the be-all-end-all of price gauging, but it certainly hasn't dropped all that much, either. The cheapest used copy there is 4900 yen or about $55. I browser around a bit and all of the other internet retailers I found still listed it for a bit under the retail price, about 6200 for this one here. (Does HMV Japan ship outside the country?) All of the other Zero games can be found cheap in Japan since they all got reprints, but given all of the drama surrounding this release, that may not be the case. In other words, if you're curious, you might want to grab this soon before it completely disappears. Why did Tecmo tell Nintendo to shove it? Also, on a side note, HMV Japan will ship DVDs, music, and books to the United States, but I haven't tried to import a game yet. I would guess they could, but going by the way Amazon tends to place regional restrictions on where a game is sold on their sites, I would guess maybe HMV might also. It is expensive to get the other Fatal Frame games as well. Due to the collective nature of this franchise it is difficult to jump in and start playing without having a good chunk of change set aside. I recently bought Fatal Frame 2, and it is a nice horror game; but I will have to wait and see if the others come down in price before becoming too interested in this one. Probably Tecmo didn't have or was unwilling to spare the resources. Since it was unofficially (sorta) announced for Europe and then almost immediately backpedaled, it suggests that Nintendo probably wanted to localize it, but there was some kind of business deal that went sour, or some other technicality that prevented it from happening. 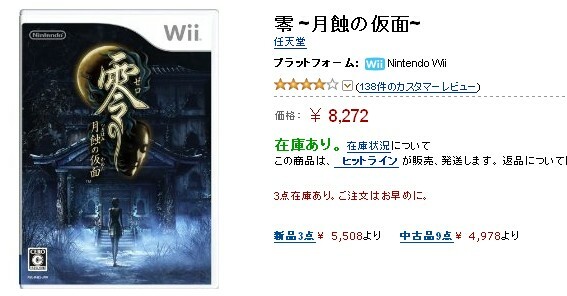 The Fatal Frame games are a bit harder to find in the US than in Japan. They got a reprint about a year ago though, and Gamestop recently dropped the price on them to $20 each, so now's probably the time to grab them before they disappear. The rumor was that the game's was flawed with glitches and that Tecmo wished to fix these flaws during localization. They supposedly asked Nintendo for funds to fix it up, but Nintendo refused. Afterwards, Tecmo reportedly refused to localize the game because they were against sending a flawed game to Europe and the States. This is all hearsay though. I have all the Fatal Frame games minus this one and Real: Another Edition. And just when I was going to get this game because I got someone who can patch it for me I go online and discover what Discoalucard found. Hopefully, I can still snag a copy.